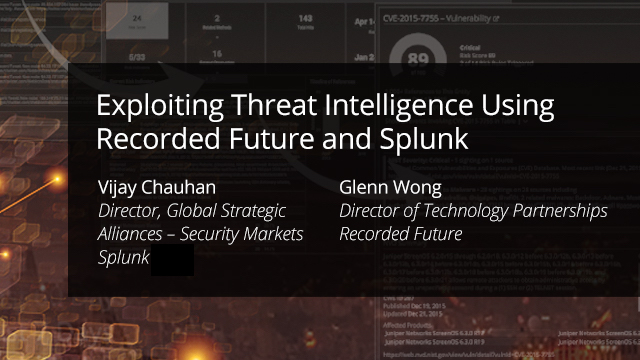 Anticipate and prioritize unknown threats better in Splunk with richer IOC context from the entire web enabled by real-time threat intelligence from Recorded Future. We will be joined by Vijay Chauhan, Director, Global Strategic Alliances – Security Markets for Splunk ES, who will provide an overview of the Adaptive Response Initiative. • Enrich data in Splunk with emerging threat indicators, actors, and new vulnerabilities from Recorded Future. • Automatically correlate suspicious network observables with OSINT context from Recorded Future. • Enhance the effectiveness of your security operations center (SOC) by actively prioritizing unknown threats. Recorded Future combined with Splunk's Adaptive Response Framework empowers analysts to proactively identify, prioritize, and mitigate emerging threats.